Butter a soufflé dish. Put the apples in a pan with 2 tablespoons of the sugar (3 if using Bramleys), the raisins with their soaking liquor and the cloves stuck into a bit of apple peel for ease of retrieval. Add a little water - just enough to stop sticking - and cook gently, tightly lidded, until the fruit collapses into a mush. Remove the cloves before crushing the apples to make a thick, jammy sauce - bubble up if necessary to evaporate any excess liquid. Fry the breadcrumbs in the butter until golden and crisp. Just before the end, stir in the chopped nuts and sprinkle with cinnamon. Remove from the heat, allow to cool a little and mix in the remaining sugar. 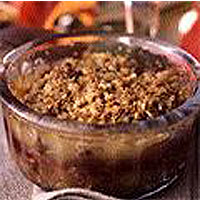 Spread a layer of breadcrumbs in the base of the dish, cover with half the apple, top with a thin layer of breadcrumbs, cover with the jam, top with the rest of the apple and finish with the remaining breadcrumbs. Bake for 15-20 minutes until brown and bubbling. Serve with clotted cream or a scoop of vanilla ice cream. Consider serving this dish, known in Denmark as 'veiled country maiden', Danish-style - instead of a main course after a sturdy winter soup, such as split-pea with bacon.